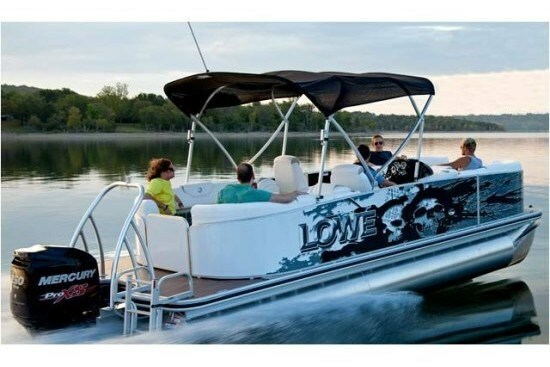 Lowe offers twenty-two models of pontoon boats for 2013 from twenty to twenty-five feet in five series. 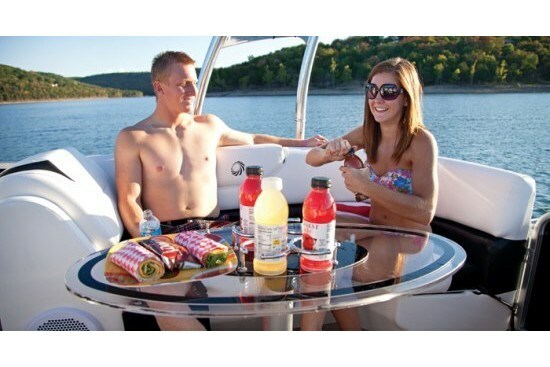 The X230 pontoon boat, subject of this review, is in the middle of three sizes of this brand new for 2013“X” series available in twenty-one, twenty-three, and twenty-five foot models. These three lengths are offered in “Cruise” models – X210, X230, and X250, and in “Fish” models – X214, X234, and X254. In describing its new pontoon line, Lowe says, “The new Lowe X Series Cruise models blend performance, versatility and style. This all-new, high-performance pontoon is just the ticket for thrill-seekers.” The three entry gates on the X230 are centrally located in the bow, stern, and port side. This provides space for four curved lounge seats – one larger two or three-seater at each of the starboard bow (which is actually a chaise lounger) and port stern, and one slightly smaller two-seater at each of the port bow and starboard stern. The seat bases for these lounges are Rotomolded of composite material and covered with DuraLux SRT™ “Soft Touch” vinyl over multi-density foam. Two-section storage compartments are found under the dual hinged lids of all four lounges. Both the driver’s seat and portside passenger seat opposite are custom swivel, reclining captain’s chairs with armrests and slider. A classy looking clear oval plexiglass table with center drinkholders floor-mounts between the two stern lounge seats and is easily accessible to both of them. 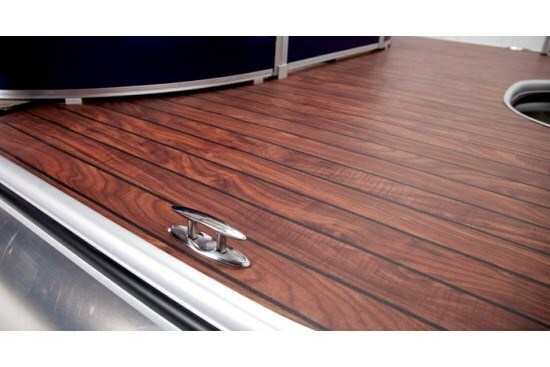 Deluxe custom weave 28-ounce carpet covers the floor of the X230 with a vinyl covering on the aft deck. A 4-step boarding ladder back here is standard. A fiberglass reinforced acrylic driver’s helm console features a tinted windscreen with quick disconnects plus chrome bezel instrumentation including tachometer, speedometer, fuel, volt, and trim gauges. 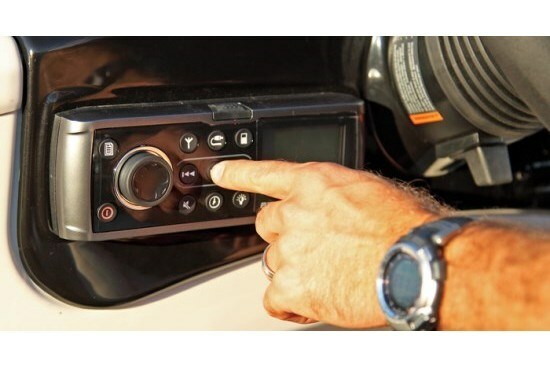 A Fusion® RA50 AM/FM marine stereo with MP3 plug-in, iPod dock and four speakers is standard as is a 12-volt receptacle and interior courtesy lighting. The standard buoyancy package includes two .080” gauge, 25”-diameter high-buoyancy pontoon logs with full length keels and 16” cross chambers. This standard set-up allows for a nine person carrying capacity, maximum weight capacity of 2,075 pounds, and maximum horsepower rating of 150. However, choose the optional XL Performance Package which gives you a third centre mounted 25” pontoon, the rough water package with lifting strakes, spray deflector, and 50-gallon fuel tank, and these capacities increase substantially to 12 persons, 2,451 weight capacity, and maximum horsepower rating of 200. 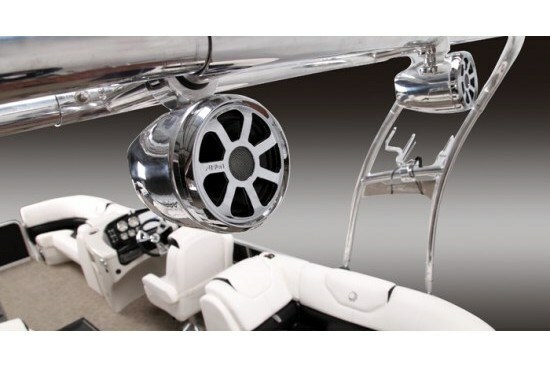 This XL Performance Package also makes available a large in-floor storage compartment suitable for waterskis, wakeboards and other watersports accessories. A heavy-duty 9’ bimini top with cover boot & quick disconnects is part of the standard equipment on the X230 along with LED docking lights. Standard colour schemes include black or pearl white fencing with white, blue, or red accenting. There are lots of option choices available, the most notable being black, tan, or red furniture, a staggering fifteen vinyl-wrap colour schemes from which to choose for the fencing, full canvas playpen cover, a deluxe helm seat, chrome steering wheel upgrade, custom wake tower with or without wakeboard and/or kneeboard racks and/or speakers, upgraded stereo system, faux-teak wood decking, underwater and other lighting options, and a painted or galvanized trailer with lots of trailer accessory choices. Power for the X230 is provided by a 4-stroke Mercury® outboard from 50 hp up to 150 hp for the standard two pontoon version, or up to a 200 Verado or 250 hp Verado Pro if you choose the optional third pontoon as part of the XL Performance Package.